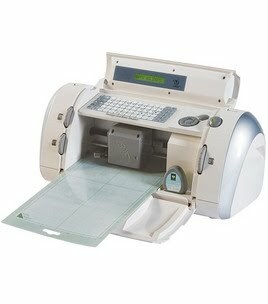 -Just a little note to let you know that Jo-Ann Fabrics is having a sale on the Cricut. It’s priced at only $84.99!! I really want one too. But I don't know about all the cartridges it needs. I think the Silhouette doesn't need them and just works off the computer. So, I'm torn! That is a great price - I paid way more for mine - like two years ago. But still worth it - that thing is super handy. Do you scrapbook? I bought this a couple of years ago on sale. I love it! !